What is poetry? If looked at from a literal and basic sense, it is quite easy to say that it is just a string of words streamed together in verse, keeping in mind a few norms of writing, and staying in a certain rhythm. However, if we go deeper into the meaning, poetry can be described as a flow of ideas presented through the ink of the poet's feelings, ideas and maybe even some hypothetically posed questions. It is not an easy task to put your deepest thoughts, sentiments and desires on paper, and it is even more difficult to put these pieces of a person's mind out into the bare public view, for everyone to read. In the case of film lyricists, the situations and subject of the verses are already provided for, but even then, a part of the poet's or lyricist's own sentiments always accompanies the fabricated lyrics on set situations of cinema. One such person, who has shared his most profound lines of verse with us, through several decades of Hindi Cinema is an undoubted poetic genius, Gulzar. His life and works can be found anywhere on the net, so here i'm just gonna share my feelings towards his words. I was recently analyzing the kind of music I like. I got out all my favourite songs, and lined them up. Then, one by one, I went ahead and googled the songs up. What I found out wasnt unexpected exactly, just a little surprising. 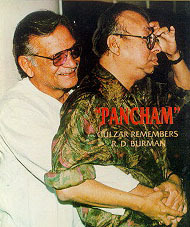 At least 95% of my absolute favourite songs had one thing in common: They had the R.D.Burman-Gulzar combo. Starting to list all of those brilliant songs would require no less than an eternity, but then, I just cannot resist myself from listing at least some examples. Songs like "Ek Akela Iss Shehar Mein"(Gharonda), "Roz Roz Aakhon Tale"(Jeeva), " Seeli Hawa Choo Gayi"(Libaas), "Jaane Kya Sochkar"(Kinara), "Mera Kuchh Samaan"(Ijaazat), "Tujhse Naraz Nahi Zindagi"(Masoom), "Tere Bina Jiya"(Ghar), and many more, are just examples of the exceptionally talented duo. People say Gulzar's lyrics were/are unconvetional and too "off the mark" to really understand. I mean, when do you usually hear such unusual metaphors like "Seeli hawa chhoo gayi, seela badan chhil gaya". True, these words are not the ones that people just humm and sing for the heck of it, and then forget before you even get to the next line. These verses really compel you to stop, go back to what you just heard, and try to comprehend the profoundness of the meaning. Every metaphor or simile, every little play-on-words, used has a meaning so deep and so enchanting that once you really understand it, you just cannot help but giving in to the sheer beauty and brilliance by which such simple thoughts are presented. 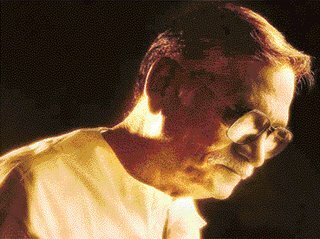 The ideas of love, longing, joy, dismay etc, have been used time and again, but every single time that Gulzar saab has presented these very ideas in his choice of lyrics, even the most trivial of ideas becomes so deep that they find their way right to the heart! If i was ever told to pick out my absolutely most touching Gulzar song, it is needless to say that I will find myself at a total loss! But, yes, i can say there are some songs and ghazals which have touched me more than others. Maybe because, some words and ideas have been able to tap my sensibilities more than others, or maybe that i have lacked in the maturity to really comprehend the meanings behind some poetry. Nonetheless, I guess that is the beauty of Gulzar's lyrics, they affect you in different ways through different stages of life. I find myself rather insignificant to be able to end this post with my own words, while i'm talking about a poetic genius. Here are words...which have moved me time and again...and give full justice the poet I truly respect, Gulzar. Scholars and revolutionaries have said time and again that the first step to change starts right from your soul. Cut to 2006. Today. India is still in a struggle. The momentary victory of independence that was gifted upon us by great souls, has faded away in a daze of corruption, illiteration, poverty and overpopulation. While before 1947, India was trapped in the binds of British imperialism, Today, after several decades, we are still bound by parasites of society that are eating away our country. We look around, and what meets the eye? Millions of people fighting the race to survive through a system which crushes them right when they try to get up. People say politicians have ruined our country, they are to blame. I say...WE are to blame. Its probably a cliché by now, but one thing has be be repeated again and again...The one who tolerates in injustice is as much the culprit as the one committing the injustice. It is so easy to just point a finger at someone, but what we dont realise is that three fingers are pointing right back at us. Taking a very simplistic example, I just recently saw the movie Rang De Basanti. The movie deals with the issue of the Indian youth being foreign to their own culture, and how they've lost all hopes in the country. Carefree individuals turning into contemporary heroes for a cause. Seems far-fetched? Well only to a certain extent. By now, I assume you're thinking...Here's another idealistic kid who lives in an unrealistic ignorant world of bliss, who finds it easy to preach about standing out and doing something for the system. Yes, I may be idealistic in my thinking, but my ideals are not baseless. Nor do they strive for something entirely inconcievable. Why do we find it so hard to take up a duty upon ourselves and just resort to pointing fingers most of the times? How many of us have actually read and understood the "Bill of Duties" of the Indian Constitution, instead of stressing on the Bill of Rights? Are we even eligible to the Right of our Constitution, after having completely side-lined our duties? I dont claim to be a righteous citizen, but i guess all i'm trying to get at is that, we as Indians, dont even have the right to critisize just any glitch in the country, unless and until we are ready to do something about it. Things will not get better, if we sit and wait for them to improve. I dont advocate violence or any drastic steps...those have never really solved any problems, just created new ones. Sure, it would be easy to just stand up and shoot down the corrupt politicians, policemen, doctors, lawyers...but till when? And how many? And what will be the result? Jail...or Death. No. Our country needs us alive. India needs our resources, our mental capabilities, our cooperation, our honesty and dedication. What we need is to take pride in our country, and work towards improving it. Instead of taking our intelligence elsewhere, we need to stay in this country. Sure, things might be a bit hard at first, when has the right path been easy? We dont live in a very "happy" world. In the rush-rush, mundane, humdrum, drab life...there are really not many things that can bring a smile to your face and at the same time, fill a certain endearing warmth in your heart, that melts the frigid coldness, that the aches of everyday routine freeze in you. One such ingenious and miraculous occurance is A Child's Smile. Everyday, when I step into the metro/train, I happen to come across the same routine stuff. People, lots of different kinds of people...but hardly any of them ever have smiles on their faces. Maybe because its the time of the evening, when people are coming back from work and are drained out from a day of labour. "What are they thinking? ", I sometimes wonder to myself. "Is that lady over there wondering what she'll have to cook tonight or deciding on who will take the dog out for a stroll in the morning? And there, the girl leaning on the pole, what is going on in her mind? Did she not do well in her test today or did she get scolded by a teacher because she was talking in class? And over there, that man with the typical grey overcoat...what is he thinking about? His next project or about the discussion he had with his boss today?" As I usually stand at some corner of the train, and trying to guess the thoughts in the minds of people...I look into my own thoughts. I replay my day, which is sometimes not a pleasant thing to do at all! Some memories make me smile to myself while some just make me break out from my dreaminess and land me right back to the harsh reality. In the midst of all this, a door opens. Now you can call this the door of the train, or the door to some moments of joy. And through the door, glides in a soulful bundle of delight. As if on cue, all heads turn, and this little angel becomes the centre of attention. Sacked up in bulky little pink clothes, the little-wonder tightly grasps the finger of an adult, who's presumably her mother. Her eyes, were large and darted from one place to another, as if scanning the train compartment to find something of interest. She might have seen everything as big and brown, tall and overbearing, dark and gloomy...which it was, compared to her bright pink attire. It was as if, the brightness of her clothes, lit up the room...but then again...it might not have been her clothes...just her presence was enough for that. While observing her, I also glanced around, and what I saw really amused me. All these people with preoccupied thoughts had tranformed into smiling invididuals, who were totally engrossed in watching the little kid, as much as I was. They probably didnt even realise it, but each and every person looking at her had a slight smile on his/ her face...and then I realised, I probably had a smile on my face too. All that I was thinking about seemed to have taken a backseat...and at that moment, the only attraction was that little bundle of joy...who was trying very hard to get out of her pram! Then...while her darting eyes hopped from one view to another...they looked right at me. Instinctively, I smiled at her. I mean, why would I not? And then...she smiled right back at me...and at that moment, I felt such a strange kind of happiness...that is really quite inexplicable. I dont even know that child, and an innocent smile got me to feel better about myself...as if i'd achieved something. Just a moment of physical gesture, was enough to swipe away a day's worth of drearyness. Ah, what the heck! I'm in a list writing mood!! Having been an NRI for a major part of my life, it really amuses me when people come up with these typical stereotypes about NRIs. Its as if we're some different species, which people characterise in their own way. So these are some misconceptions that i often come across, in India. 1. All NRIs are filthy rich --- We would want to be, but the thing is...there is a Big difference between what you want and what you get. I want to be Sushmita Sen..but Am I?...HELL no!! 2. NRIs all have American accents when we speak in English and they forget their Indian Languages --- Irrespective of the fact whether you're an NRI from Srilanka, or one from Zambia, or Alaska, people kinda expect you to have the typical american accent and kinda have an "air" of foriegnness! NRIs ...at least not ALL of them...dont forget their mother tongue, just because they've been out of India. I remember this, one year after moving out of India, when I visited home for the first time and called my friend, the first thing she told me was..."Arre, but you still speak Hindi". I wanted to reply, " Yes hunny, that part of my brain still exists you know, it doesnt go away just because i have a foreign visa stamped to my passport!" 3. NRIs are Non Returning Indians---BIG misconception. Its true that a lot of people who go out of India dont come back, or dont want to come back...but its also true that many DO want to go back to their country. Its not a One Way Trip. 4. NRIs are snobbish---another huge misconception! The thing is, its really unfair to generalise this snobbish characteristic on All existing NRIs. I mean, they do exist, obviously, but then they're not the only people who are snobbish. And not ALL of them are snobs. 5. NRIs forget how life is in India and cant survive if they decide to come back --- again, that is just a generalization. Its more of a matter of adaptation. I mean, why only NRIs...if a person from Delhi moves down south to Chennai..there will be adjustment problems. So its a myth that NRIs somehow cant get accostumed to India once they're out. Can come up with some more...but I have to go now! I was just going through some blogs ( yes...i have exams coming up..yes i have a room to clean, yes, i have to study for today's lecture...and yes, i'm a velli by nature!). So yeah, i was going through some blogs, and i realised this is like a hot topic among bloggers. So, since i dont wanna strain myself thinking about what to write, i'll write about this too! So here goes..
17. A classmate who thinks its her duty to provide the teacher with a running commentary of her stupid answers! 19. Writers like John Grisham, Jeffery Archer, Sidney Sheldon and the likes...Superficial as hell! 20. People promising to give newcomers a break and then disappearing into thin air! Well the list is longer...but i have to run along now...! !